This cookie waffle recipe from Elise Strachan of My Cupcake Addiction will be fun for the whole family. 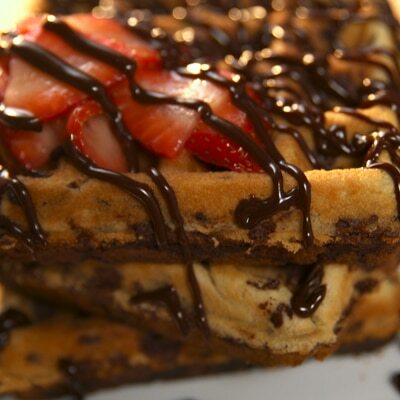 Mix up dessert tonight with a fun twist on waffles! TOSS berries and sugar in a medium bowl; set aside. HEAT semi-sweet chocolate morsels and cream in a medium bowl set over, not in, a pan of simmering water. Once the morsels have started to melt, remove from heat and stir until saucy. Set bowl aside over the warm water. COMBINE flour, baking soda, baking powder and salt in a small bowl. BEAT butter, granulated sugar, brown sugar and vanilla extract with an electric mixer in a large bowl until creamy. Add eggs, one at a time, beating well after each addition. Beat in the milk. SERVE drizzled with chocolate sauce and berries.